Phone rings…… Someone picks up the phone. The Caller: Hello. May I speak to Mr. Abhiram Satpathy? Abhiram (Someone): Yes. I am speaking. Caller: Congratulations sir, you have won a car worth Rs. 5 Lakhs. 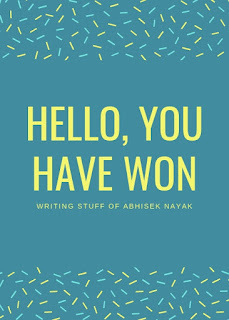 Abhiram (being conscious about the frauds happening these days): Oh okay, but, how did I win? I don’t remember being any part of contests or something. Caller: Sir, you have been selected randomly from the customer database of the shopping network ‘WeShop’. Our company do this at regular intervals every year. Also, if you don’t want to take the car then we can end the money (Rs. 5 Lakhs) instead of it (car). Abhiram: Thank you very much, when I shop from your network, I always get notifications for the same through e-mail, automated SMS and app but this time I only got the SMS. Caller: I understand your concern sir but we provide notifications regarding these types of contests through SMS only. So, what do you want to take the car or money?